It is time for another challenge on the Butterfly blog and this time the letter on the wheel is 'M' and we have a choice of three themes and three colours as usual and of course a butterfly should be included. For the themes I've chosen 'musical' and 'metallic' with the colours of medium blue, mint green and moss green but as sometimes happens my scanner seems to have changed the colours slightly but in real life the butterfly is mint green and blue!! All three colours are incorporated in the background which is the result of an inky play a while ago with Distress Oxides and a stencil. The music and metallic come into play with the copper panel which was embossed and I couldn't resist adding a treble clef. Music also features behind the butterfly. There is some great inspiration from Mrs A and of course some lovely prizes on offer so why not have a go? Playing catch up as been away for a few days so forgive me if I don't comment on all you've posted since last week! Like this butterfly very much! 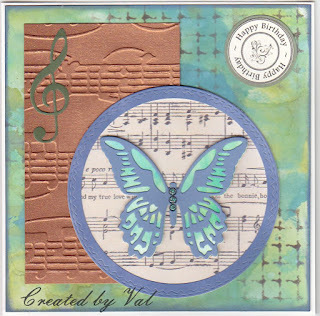 The background makes it pop and the music embossing is lovely! preciosa tarjeta , felicidades !!! 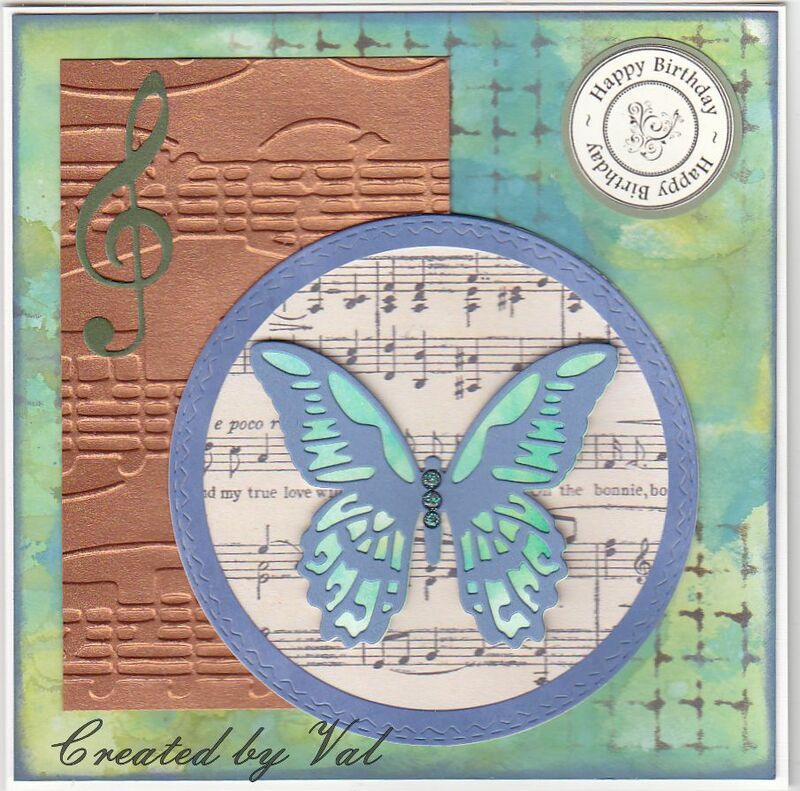 Val, I love how you have put this card together the colours look so good together. I really deliberated when I put this wheel together using two greens but I'm happy with the resulting 2 cards that have been posted so far. Thankyou so much for coming and spinning the wheel with me. Hugs Mrs A.
I love how you added all the musical elements to this pretty card! I really like the copper panel with that butterfly too!